One of twelve children, Richard Wayne Penniman’s earliest musical memories were singing as part of the family group in churches; like his father before him he became a preacher. In his early days he sang and healed people; it was great schooling for his future as a rock ‘n’ roll showman par excellence. When he was 13 years old he sang with gospel legend Sister Rosetta Tharpe (a woman who knew a thing or two about mixing secular and gospel music). There were other gospel artists that influenced him but it was a blues ‘shouter’ named Billy Wright from whom Richard took his style in clothes, hair and make-up. Little Richards first release was in 1951 on RCA; ‘Taxi Blues’ is closer to R & B than rock ‘n’ roll, but there is the undercurrent of something more outrageous on this record. His third RCA single was the joyous, ‘Ain’t Nothing Happenin’. This and his other singles did very little in sales, after which he signed to Peacock Records where his releases met a similar fate. At Lloyd Price’s suggestion Richard recorded a demo and sent it to Specialty Records in Los Angeles. Art Rupe who owned Specialty bought out Richard’s contract and Bumps Blackwell set about recording him in New Orleans, but to begin with they could not get the right sound. "So I called a lunch break and we went to the Dew Drop Inn. Richard saw a piano and a crowd of people: he was one of those people who's always on stage, and he hit the piano and hollered, 'A-wop-bop-a-loo-bop-a-good-God-damn!' – and those were the cleanest words of it.” Back in the studio Blackwell brought in a writer named Dorothy LaBostrie and she came up with the rest of the lyrics for ‘Tutti Fruitti’; they got it down in three takes. 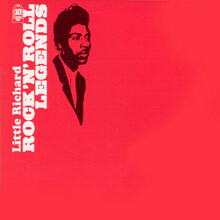 By early 1956 it was at No.2 on the R&B chart and No.17 on the billboard chart; Little Richard was on his way. Ironically Pat Boone’s cover sold more than Little Richard’s version. It was typical of the time with labels targeting separate records at the black and white market. 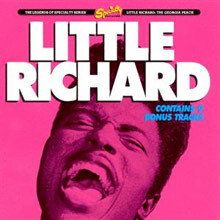 To compound the insult, Boone covered Little Richard’s next record too. 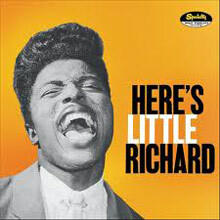 ‘Long Tall Sally’, recorded on 10 February at J&M Studio in New Orleans, came out in April 1956 and from that moment on Little Richard really was on his way; it was also the first of Richard’s classic singles on which either side was capable of being a massive hit. ‘Long Tall Sally’ spent 8 weeks at the top of the R&B charts, while the b-side, ‘Slippin and Slidin’. was at No,2 On the Billboard chart ‘Sally’ got to No.6 and ‘Slip’ to No.33. It attests to the power of the record. ‘Sally’s’ driving piano and honking sax is archetypal New Orleans, but it is at the same time unique. Both Blackwell and Richard thought it was going to be to fast for Boone to cover, but cover it he did. Elvis covered it, so too did The Beatles on their 1964 EP, Long Tall Sally; before they found fame The Beatles worked with Richard in Hamburg and Paul’s “oohs” in ‘She Loves You’ are taken straight out of ‘Long Tall Sally’; ‘Sally’ was also the last song the Beatles performed at Candlestick Park in San Francisco, which marked the end of their touring career. With Richard’s records cutting through, he was soon playing live outside of New Orleans, but initially in venues that were black only. By the time of his third single becoming a hit, he was touring further afield, even getting as far as Klamath Falls, Oregon (pop 15,875). There was also a change in that, mixed audiences were more commonplace; inadvertently Pat Boone covering Richard’s records had made people aware of the originator. Specialty was in no doubt, they had someone special on their hands with Little Richard and soon had him back in the studio again. Richard was a natural for the movies and Specialty were not slow in pushing him in that direction in order to expand upon his appeal. The first was The Girl Can’t Help It starring Jayne Mansfield in December 1956. Filmed around the same time was Don’t Knock The Rock, which starred a whole string of rock ‘n’ roll stars including Bill Haley with Richard contributing ‘Long Tall Sally’. In the spring of 1957 out came Mister Rock and Roll starring Alan Freed in which Richard played, ‘Lucille’. Richard’s title song for the film, ‘The Girl Can’t Help It’ is another classic New Orleans rock ‘n’ roll record, but has enough that is different about it to mark it out from other records from the genre. Written by Bobby Troup (who also wrote ‘Route 66’) it got to No.7 on the R & B chart and No.49 on the Billboard chart. Despite its relatively poor chart showing it is still in Rolling Stone’s ‘Greatest 500 Songs of All Time’. Chart wise it was back on track with his next release, helped by its use in the Alan Freed film. A lot of people are unaware that Lucille was co-written by Richard and blues guitar great, Albert Collins. It had its release in February 1957 and within weeks it was at No.1 on the R & B chart where it stayed for 2 weeks. Inexplicably it could only make No.21 on the Billboard chart, but did stay on the chart for 5 months. It’s been covered by such diverse artists as, Queen, Waylon Jennings, The Beatles and The Flying Burrito Brothers. The b-side, ‘Send Me Some Lovin’ is indicative of both Richard’s gospel roots and where his heart was heading; it is also further proof of what a brilliant vocalist he was. In October 1957, during the fifth date of a two-week sold-out tour of Australia, twenty five year old Little Richard found God. He was there with Eddie Cochran and Gene Vincent, and after a scare on a flight from Melbourne to Sydney, where Richard was to play to 40,000 fans, Richard quit the tour to become a preacher in the Seventh Day Adventist Church. Stories about the plane on which Richard was supposed to be returning to the USA crashing in the Pacific Ocean are an embellishment as no such crash occurred. Specialty Records insisted on one last session to fulfill his contract which took place on 18 October 1957. After this he performed one more show at New York City’s Apollo Theatre and then he formed the Little Richard Evangelistic Team to travel throughout America as well as working with down and outs on skid row in Los Angeles. His first hit after quitting rock ‘n’ roll was the tremendous, ‘Good Golly Miss Molly’ that had a piano intro based on Ike Turner’s playing on Jackie Brenston’s ‘Rocket 88’ (it all added to Rocket 88’s collateral as the first rock ‘n’ roll record). ‘Miss Molly’ got to No.4 on the R & B charts and No.10 on the Billboard chart. A couple of other minor hits recorded at the Specialty session in October was all that was heard from Little Richard as far as most of the public was concerned for the next 6 years. Specialty’s A & R man Sonny Bono (later Cher’s other half) discovered Larry Williams, Lloyd Price's former valet, and he sounded a lot like Little Richard and had hits with ‘ Short Fat Fannie,’ and "Bony Moronie’; but there ain’t nothing like the real thing. "He was singing gospel songs the way they should be sung; he had that primitive beat and sound that came so naturally.” – Mahalia Jackson on hearing Richard sing in Church in the early 1960s. Richard did carry on recording, but it was purely gospel music. Records that included ‘Ride On King Jesus’ and ‘It's No Secret (What God Can Do)’ did not sell enough to chart. In 1962 when Little Richard was still firmly on the gospel trail, he was booked on a tour of Britain (he went by ship, still scared to fly). Richard thought he was there to sing gospel songs and on his first night, with Billy Preston playing organ he entertained the bewildered fans with ‘Peace in the Valley and ‘I Believe’; the promoter could smell disaster. By the time of the second performance, after having watched Sam Cooke who had missed the first show, knock ‘em dead, the self proclaimed, ‘Architect of rock ‘n’ roll’ decided it really was here to stay. He sang ‘Long Tall Sally as his opening number and never looked back. By the time the tour got to Liverpool the act was back, honed to perfection; it was all witnessed by the second act on the bill – The Beatles. It was a meeting of the old and the new – not that Little Richard would ever acknowledge such a thing. The following year he was back in Britain, this time on a bill that included Bo Diddley, with the Everly Brothers headlining. Way down near the bottom of the bill were the Rolling Stones. Little Richard closed the first half, singing, 'Long Tall Sally', 'Rip It Up', 'Tutti Frutti', and 'Lucille'. During 1964 Richard went back to recording for Speciality. ‘Bama Lama Bama Loo’ was his first hit on the Billboard chart in 6 years, although it only got to a lowly No.82. Soon a young guitarist calling himself Maurice James joined Richard’s band and played on a number of recording sessions; this was Jimi Hendrix. Richard switched to the Vee Jay label, but none of his releases did very well, the modest exception being, “I Don’t Know What You’ve Got But It’s Got Me’ that reached No.12 on the R & B chart. Hendrix played on many of the re-recordings that Richard made for Vee Jay of his biggest hits. Little Richard had been making records for four years before he rolled into Cosimo Matassa's J&M Studio in New Orleans and cut the epochal "Tutti Frutti" in the fall of 1955, but everything else he'd done -- and much of what others had recorded -- faded into insignificance when Richard wailed "A wop bop a loo mop a lomp bomp bomp" and kicked off one of the first great wailers in rock history. In retrospect, Little Richard's style doesn't seem so strikingly innovative as captured in 1956's Here's Little Richard -- his boogie-woogie piano stylings weren't all that different from what Fats Domino had been laying down since 1949, and his band pumped out the New Orleans backbeat that would define the Crescent City's R&B for the next two decades, albeit with precision and plenty of groove. But what set Richard apart was his willingness to ramp up the tempos and turn the outrage meter up to ten; "Tutti Frutti," "Rip It Up," and "Jenny Jenny" still sound outrageous a half-century after they were waxed, and it's difficult but intriguing to imagine how people must have reacted to Little Richard at a time when African-American performers were expected to be polite, and the notion of a gay man venturing out of the closet simply didn't exist (Richard's songs were thoroughly heterosexual on the surface, but the nudge and wink of "Tutti Frutti" and "Baby" is faint but visible, and his bop threads, mile-high process, and eye makeup clearly categorized him as someone "different"). 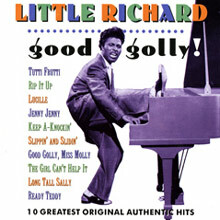 These 12 tunes may not represent the alpha and omega of Little Richard's best music, but every song is a classic and unlike many of his peers, time has refused to render this first album quaint -- Richard's grainy scream remains one of the great sounds in rock & roll history, and the thunder of his piano and the frantic wail of the band is still the glorious call of a Friday night with pay in the pocket and trouble in mind. Brilliant stuff. 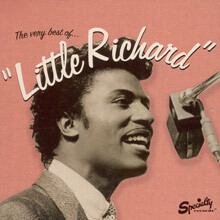 The Very Best of Little Richard is the first high-profile, high-quality Little Richard compilation to be released in the U.S. since 1991's The Georgia Peach, a disc that held the title of best available Little Richard hits collection for roughly 17 years. The Very Best is designed as a replacement to that collection, partially because The Georgia Peach was a little old but also because Concord Music Group -- the label that formed in 2004 when Concord and Fantasy Records merged -- now owned the Specialty Records vault and could use their own new Little Richard collection. So, Concord Music Group revived the Specialty imprint and released this excellent hits collection, which at 25 tracks is just as long as The Georgia Peach. Fully 20 of those 25 tracks are shared between the two compilations, which should come as no surprise as these 20 tracks are the big hits and standards, ranging from "Tutti Frutti," "Long Tall Sally," and "Good Golly Miss Molly" to "Ooh! My Soul," "Bama Lama Bama Loo," and the medley of "Kansas City/Hey Hey Hey Hey" that the Beatles later covered. As The Very Best of Little Richard ends a little anticlimactically with a perfunctory rehearsal take of "Hound Dog" from Richard's last session, a pedestrian demo of the blues "Baby" from his pre-Specialty days, and a surprisingly tame live medley from 1964, this pales slightly in comparison to The Georgia Peach, but that's nitpicking: apart from these three OK cuts, this is as good a Little Richard compilation as you can get, which means this is as good as rock & roll gets. Absolutely flawless ten-song budget collection of Richard's best. All the original Specialty recordings of "Tutti Frutti," "Long Tall Sally," "Slippin' and Slidin'," "Lucille," "Keep A Knockin'," "Rip It Up," "Ready Teddy," "Jenny Jenny," "The Girl Can't Help It," and "Good Golly Miss Molly." If you need a quick fix of Richard's absolute best, grab this one, you can't possibly go wrong here. 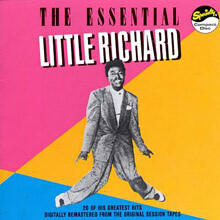 Speciality's The Essential Little Richard lives up to its billing, featuring 20 of Little Richard's finest recordings for the label. Not only are all the hits here, but there's some terrific lesser-known tunes and cult favorites slipped on at the end of the record, making this yet another great compilation of Richard's Specialty material. It proves that it would be nearly impossible to release a bad compilation of these recordings. Perhaps the greatest of Little Richard's greatest hits compilations, the 25-track Georgia Peach features all of his biggest hits in chronological order, as well as terrific singles that never were as big as "Tutti Frutti" and "Good Golly Miss Molly." On top of the sublime song selection and sound, the liner notes by compiler Billy Vera are splendid and insightful. Little Richard's ultra-flamboyant style and over the top stage presence prefigured later figures like Elton John, and if Richard used the piano as much as a prop as he used it as an instrument, the fact remains that he had a big hand in casting the template for rock & roll piano. His songwriting, too, a delightful mix of lust and nonsense, helped shape rock's self-image as music of pure kinetic fun and freewheeling, rebellious abandon. This set has classic performances of some of his biggest and most enduring hits like "Long Tall Sally," "Lucille," "Jenny, Jenny," and "Good Golly Miss Molly" in the original single versions. Richard is in full vocal flight here, and if he has been viewed more as a character than as a musician in recent years, the proof that he knew how to burn down the house at the piano is on full display here.